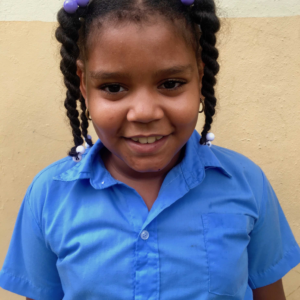 Anyeiri Santo de Jesus is 8 years old and in the Fourth Grade at the public school in La Represa. She lives with her mother, grandparents, and one of her two sisters. Her father lives and works outside of the community and she does not see him regularly. She likes to jump rope, draw, and play basketball. While at home, she enjoys washing dishes and mopping the floor. Anyeiri wants to be a doctor when she grows up so she can help sick people.